Please know up front that I admire this band and in no way intend to disparage them. In general progressive rock groups don't make for very good "best of" compilations. My basic problem with the concept is that I don't want a youngster buying "Genesis - The Hits" or "The very best of Emerson, Lake and Palmer" and judging their whole careers by a dozen shorter tunes culled from their impressive catalogue. I'm also enough of a realist to know that such assemblages are inevitable and a necessary evil of the music biz. In the case of Jethro Tull, two collections and a live concert had already been released years earlier but in 1985 CDs were booming and new disc player owners wanted to take advantage of this "cutting edge" technology so the suits at Chrysalis decided that a remastered rehash of recognizable songs would sell like hotcakes in the audiophile world. Thus we have "Original Masters" to peruse. I found this CD in my wife's jumbled mass of music one day recently and gave it a spin. First of all I must warn you that there's an overriding annoyance of too much emphasis on the higher register on everything that may well be an unforeseen side effect of that aforementioned "new" technology that gave birth to this set. Secondly, it seems to me that there were a lot of songs along the lines of, say, "Beggar's Farm" that were in much more need of remastering at that juncture than most of these cuts but then I don't think the average Joe on the street would have eagerly plopped down his hard-earned cash for an eclectic mix of early and obscure Jethro Tull so I can savvy the marketing logic. "Living in the Past" is a good choice for an opening tune. The prog imp in me has a true affection for songs in 5/4 that manage to become hits because I like to imagine the typical Barbie & Ken trying to dance to it. Plus Ian Anderson's flute performance is superb. With "Aqualung" the brightness of the treble range is almost painful and is there really that much reverb on the original? Perhaps I just didn't notice before. "Too Old to Rock 'N' Roll, Too Young to Die," while not very lofty on my JT list to begin with, suffers from a lack of depth, feel and emotion here and it comes off very sterile. I will always savor the piano intro to "Locomotive Breath" but when the heavy guitar bursts in I'm reminded of what I don't like about the tune. "Skating Away on the Thin Ice of the New Day" comes through this process relatively unscathed, however, and the delightful, almost Cajun meld of acoustic guitar, flute and accordion makes this track one of the best of the bunch. The infamous "Bungle in the Jungle" is included, of course, although I personally think this well-intentioned but too-commercial satire of modern society is a bit of a blight on their reputation. Again, the high-end borders on excruciating (and consider that my hearing is not the best in the world). "Sweet Dream" is an interesting number reminiscent of their early sound but I'm one who steadfastly thinks that other cuts like "Bouree" were more deserving of inclusion from that era. "Songs from the Wood" with its Robin Hood & his merry male chorale beginning is another highlight along the way. The clever blend of old and modern instrumentation makes this song a treat to hear. The Mellotron on "Witches Promise" gives a broader dimension to the light atmosphere of this rarely-heard tune but it pales in comparison to the too-brief sample of "Thick as a Brick" that follows it, demonstrating the almost-criminal injustice of editing for the impulse buyer. Akin to tasting only a single bite of a delicious five-course feast, I can only hope that this three-minute snippet of greatness will spur a hunger in the intrigued neophyte to procure the masterpiece in its entirety whereby he/she will joyfully discover the awesome art this band was capable of producing. "Minstrel in the Gallery" moves along promisingly until the loud guitar section takes over and ruins the mood for me. The tinny audio doesn't help, either, but this gallant yet ultimately disjointed track continues to just not work for me no matter how many times I give it a listen. The innocuous "Life's a Long Song" ends things on a decent note. I can't in good faith recommend this to anyone, but several excellent numbers keep it from being a travesty. 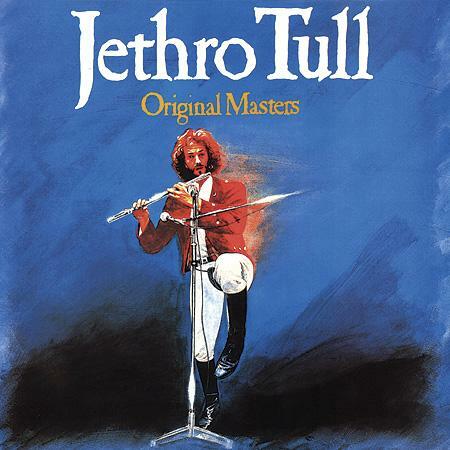 There are vastly better "greatest hits" albums from Jethro Tull to be had so that pretty much disqualifies the limited "Original Masters" from honest consideration in that category. If you are new to JT's music then please start with the exemplary "Thick as a Brick" album because there's a damn good reason it continues to hover at the pinnacle of the PA list. The song selection on this CD doesn't represent these guys very well and, while the audio might have sounded spectacular in 1985, it hasn't aged gracefully at all. 2.1 stars.